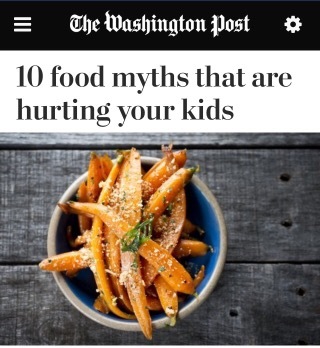 Here are 10 common myths that mischaracterize vegetables — followed by facts about why these vegetables are worth a place on your child’s plate. A fellow mom recently asked me whether cucumbers and celery really count as green vegetables. She had heard they don’t offer much nutritional value because they are mostly water, so she figured she shouldn’t worry about encouraging her children to eat them. Great question. But although these vegetables might not be the MVPs of the nutrition game (we’ll leave that to the dark leafy greens), they all have a place on the team. The Centers for Disease Control and Prevention says children, depending on age and activity, should eat one to three cups of vegetables every day (and nine out of 10 American kids don’t get enough). This is a significant amount, so perhaps we shouldn’t so hastily dismiss those cucumbers. The truth is, all vegetables count toward the CDC recommendation, as they all provide health benefits — just in different concentration. Cabbage may be inexpensive, but it is not ineffective. Part of the cruciferous family of vegetables that includes kale, cauliflower, broccoli and Brussels sprouts, cabbage is high in fiber for healthy digestion and satiety, vitamin C for the immune system and the absorption of iron, vitamin K for healthy blood and circulation, and cancer-fighting compounds. Yes, my daughter likes to pretend she is a bunny when she eats her carrots, but this vegetable isn’t just for pets or kids. Carrots contain high amounts of vitamin A for eyesight and immunity, vitamin C for that strong immune system, and fiber. As for its natural sugar, the fiber in a carrot slows down the absorption, so there is a much smaller effect on one’s blood sugar. High-fructose corn syrup has certainly damaged corn’s reputation, but the vegetable and the sweetener have little in common. All of the nutrition and healthy fiber in the corn plant has been stripped from the syrup. Corn is a high-carbohydrate vegetable, so it shouldn’t be the only one your child eats. But it provides thiamine that helps convert carbohydrates into energy, heart-healthy folate, and antioxidants to help fight disease. Much of the conventional corn in the United States grows from genetically modified seeds, so buying organic — always a good idea in the vegetable world — is especially recommended. Yes, cucumbers are 95 percent water, helping our bodies stay hydrated in hot temperatures, but they also provide antioxidants such as vitamin C and beta-carotene that help us fight cellular damage, B vitamins that support nerve health, potassium for heart health, and fiber. Celery is not just a tool to stir a bloody mary or an accompaniment for chicken wings. The vegetable provides vitamin K for blood health, folate for red blood cell production, vitamin A, fiber and yes, lots of water. Celery has been shown to lower blood pressure and the risk of cancer. Known in ancient times (and in horror movies) as a tool to ward off witches and vampires, in modern times garlic is equally as powerful at keeping us healthy. This vegetable has been shown to lower blood pressure, protect the heart, fight cancer and regulate blood sugar levels and is antibacterial and antiviral, which means it is helpful during cold and flu season. Never say no to an onion, especially during allergy season. Onions are high in quercetin, an antioxidant known for being a natural antihistamine. Onions have also been shown to support heart health, and they provide vitamin C, calcium, iron, folate and fiber. More than a vehicle for blue cheese dressing, iceberg lettuce can provide a significant portion of the daily requirement of vitamin K to keep our blood and bones strong and vitamin A for our eyesight and immunity. Yes, darker varieties of lettuces and greens provide more nutrition per serving, but if iceberg will get your kid to eat a salad, embrace it. What a waste that this herb is most often used as a disposable garnish, because ounce per ounce, parsley has 33 times the amount of vitamin C, 16 times the amount of vitamin K, six times the amount of iron and four times the amount of calcium as lettuce. Oh, and don’t forget the folate, fiber and water. Potatoes have a bad reputation as either a french fry or a nutritionless white carb, when in fact they provide twice as much potassium as a banana, vitamin B6 for nerves and mood, vitamin C and fiber. Potatoes have a high glycemic index, which means they can affect blood sugar, but that alone shouldn’t convict the vegetable. A person with blood sugar issues, diabetes or weight problems might want to limit their potato intake, but the rest of us should enjoy them in moderation to reap their vitamin and mineral benefits. But watch out for those fries — you’ll also be getting unhealthful fats. Happy dog days of summer foodie friends…. but shouldn’t we make those choices with knowledge?